Just Care More is a 501(c)3 non-profit organization focused on showing kids that they are loved and supported. While the love and support of a family member cannot be replaced, the foundation can help at-risk children understand that the world is filled with people that care about them and support them. Just Care More has a hand-on philosophy and approach. The foundation focuses on reaching the children who need support the most. In each city Just Care More visits, staff will go into group homes such as Boys and Girls Clubs and similar organizations to provide motivation and mentoring. Jamie often shares his story of adversity and speaks with the groups one-on-one to connect with them on a more intimate level. Just Care More also established Camp Just Care More in 2016. The camp grants attendance to at-risk children and focuses on teaching accountability and responsibility. Counselors are extreme sports athletes and other inspiring personalities that also faced hardships in their adolescence. The counselors are matched with children based on similar interests and hardships, resulting in lasting relationships and enduring positive impact on the campers. In the end, the goal of the camp is take troubled campers and turn them into the inspirational counselors for the next generation of camp. Just Care More believes in a movement. A movement where people all over the world who have experienced pain and adversity are able to share their experiences and help others that have felt similar suffering. The foundation has encouraged over half a million people to get off the couch and attend their interactive events. Further, Just Care More has given over twenty thousand complimentary tickets to at-risk children to attend Just Care More events. 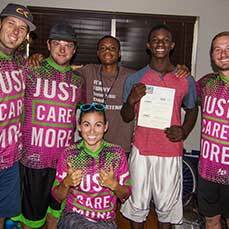 Just Care More creates adventures that inspire and teach people of all ages to be rad and respect their dreams. Just Care More has recently announced the release of a new nomination program. This program allows the public to nominate children in need from within their own communities who have overcome or are currently dealing with adversity. Just Care More will select children and provide sponsorships to these children, such as monthly memberships to rock climbing gyms, trampoline parks, art classes etc. The Just Care More philosophy is very hands-on, a mission centered on going out into the community to reach the children who need support the most. 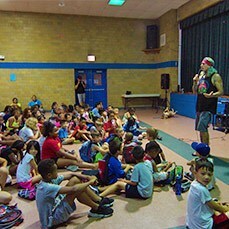 Each city that the tour goes to, Jaime and staff will go into group homes such as Boys and Girls Clubs and other organizations that can benefit from the program’s mentoring and motivational approach. Jamie shares his story and speaks with the groups one-on-one to connect with them on a more intimate level. Just Care More is not only about changing the lives of others thru it’s direct action. It aims at creating a movement, in which people all over the world who have experienced adversity are able to share their experiences and help others experiencing the same adversity. 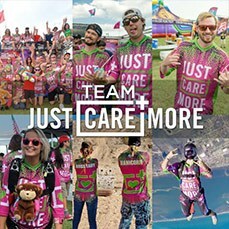 Team Just Care More are a group of people showing that you can change the world just by caring a little bit more. A portion of the proceeds raised through Just Care more will provide the funding to build a camp in which kids from group homes and underprivileged communities around the country to attend a 1 week camp – Just Care More Camp – where they will be exposed to key life fundamentals aimed at providing a layer of support and understanding for the campers.